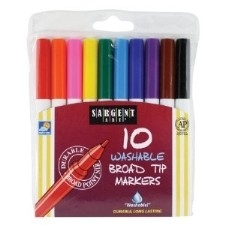 Sargent Art 10-Count Washable Bullet Tip Broad Markers in Pouch provide great illustration detail with 10 of the most popular colors. All 10 washable, vibrant color markers have bullet tips and come in a plastic, resalable, peggable pouch. Markers wash easily from most fabrics and skin with soap and water. AP Certified non-toxic.